Custom designed tablets provide special features that are required for specific uses. Industrial, military, or medical tablets may require a unique external interface, network connectivity, display, operating system, enclosure, and more. The Internet of Things (IoT) refers to the inter-networking of electronic devices that enable communications and the exchange of data. This promises convergence of electronic infrastructure, improved efficiency and accuracy, and a lot of time and money being saved through proper exploitation of collected data. The IoT is placing new requirements on portable devices, including tablets, which deviate from commonly available features on commercial off-the-shelf (COTS) tablets. The following describe some custom features that may be required of tablets for IoT use. COTS tablets are usually have a single physical interface, typically micro USB (Android) or the Apple Lightning connector. In the field, some tablets may require cabled connections to various peripherals, including serial connections to sensors, Car Area Networks (CAN) often through the ubiquitous ODB interface, Ethernet, analog signals, displays, and storage devices. These interfaces may be added to custom tablets. Digital sensors are integral to the IoT; they are the eyes and ears of devices. Sensors often communicate wirelessly via Bluetooth (particularly Bluetooth Low Energy or BLE), Wi-Fi, cellular, ZigBee, Lora and SigFox. COTS tablets typically provide Wi-Fi, Bluetooth, and sometimes cellular connectivity, but lack capability for the other listed networking standards. During field operations it may be useful to wirelessly connect to each of these types of sensor networks. An IoT-enabled custom tablet can provide such sensor network access, streamlining in-field diagnostics, maintenance, monitoring, and set-up. Consumer tablets may have cellular communication as options and are conventionally certified for operation with mega carrier LTE networks. Emerging IoT-focused cellular standards, such as CAT-M and the less expensive NB-IoT (or CAT-M2) are currently being introduced. These enable cellular data transmission at relatively low bandwidth (not suitable for streaming video) but for lower implementation and cellular data costs. A custom tablet can integrate an IoT-grade cellular modem for low bandwidth and low cost data transmission, reducing cellular data costs over the long term. Most COTS tablets run Android, Windows or iOS operating systems. A custom tablet must be able to run a customized operating system to take advantage on non-standard interfaces or use cases. iOS is a closed operating system, and not useful in a customize tablet. Android is the most common operating system utilized in custom tablets, since full source code is available, making it relatively easy to customize. Windows is also an option. Alternate operating systems have specific uses. Linux, for example, provides the benefits of open source (and therefore capability to customize) while allowing low level control of hardware interfaces, security policies, and GUI development. Real time operating systems, such as VxWorks, serve applications that run with specific time constraints (such as sensor data sampling and critical system control) and must deterministically process data. User interface management becomes a lower priority. VxWorks provides libraries for GUIs and can therefore implement an operating system for an IoT custom tablet. Security takes many forms and is of highest priority for military, medical, and industrial tablets. The ability to boot into and execute a single application, require the strongest encryption and authentication methods when networked, block unintended access through external connections, detect physical tamper, control the update of tablet firmware and software, and more. COTS tablets are notorious for forced software updates and aren’t locked down to run a specific application. Some of these issues can be overcome via add-on software. However, modifications to both tablet hardware and to the operating system at a low level provide the most control in locking down tablet operation as desired. The use of operating systems, such as SE Android and SE Linux, are helpful and can be used to enforce access policies. As the Internet of Things grows in its implementation, the need for IoT-enabled tablets will grow to support field operations in industrial, medical, and military fields. This may necessitate the development of tablets with nonstandard interfaces, whether wired through connectors or wireless. 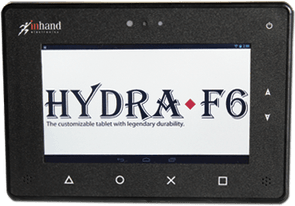 InHand Electronics is a leader in the design and development of custom portable and tablet-like devices for industrial medical and military use. With expertise in low port, battery operated design, wireless networking, human-machine interface (HMI), operating system customization, and rugged device packaging, InHand can assist in finalizing use cases and requirements and then take the device through design, verification, regulatory certification, and production. Contact InHand for an evaluation of your requirements.